Tips: Remember to use overly ripe, blackened bananas. This will give you the most banana flavour. You don’t have to buy a bunch of bananas and wait [for what seems like forever] for them to blacken; whenever you have a banana that you can’t eat in time, let it blacken and throw it in the freezer. When you’ve collected enough bananas for a loaf, simply defrost as many as you need. Also, banana bread freezes well. I like to freeze individual slices for random snacks, packed lunches, and trips. Preheat the oven to 350 F. Grease and lightly flour a loaf pan and set aside. In a medium sized bowl, whisk together the flour, baking soda, and salt (if using) and set aside. In the bowl of a stand mixer, beat the melted butter and sugar on medium speed until combined. Then mix in the eggs and bananas. On low speed, add the dry ingredients and mix until well incorporated, but do not overbeat the batter. On the lowest speed, gently stir in the nuts and/or chocolate chips, if using. Pour the batter into the prepared loaf pan and sprinkle on the topping of your choice (optional). Bake until an inserted toothpick comes out clean or has a few crumbs attached, about 1 hour, rotating the pan halfway. Place the pan on a wire rack to cool for 5 to 10 minutes before running a knife along the edges (if necessary) and removing the banana bread by inverting the pan. Set the loaf on the wire rack to cool completely before slicing. Banana bread freezes well. 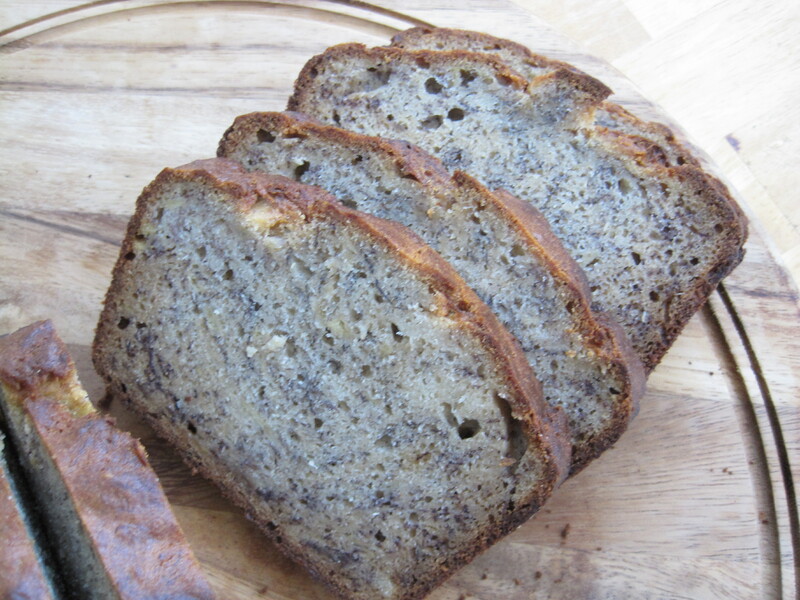 I think this banana bread could be a great addition to a Summer picnic. Thanks for the recipe. I love bananas! So I made this! Although it made enough batter for 1.5 loaves. so I made muffins. I burned the muffins and undercooked the loaf. They couldn’t seem to agree. So sad. But if I eat them at the same time, it kind of averages out. Yay math! Oh no! I’m glad that it was at least tasty 😦 Thank you so much for your comment! This is one of the best banana loaf ever!!!! !